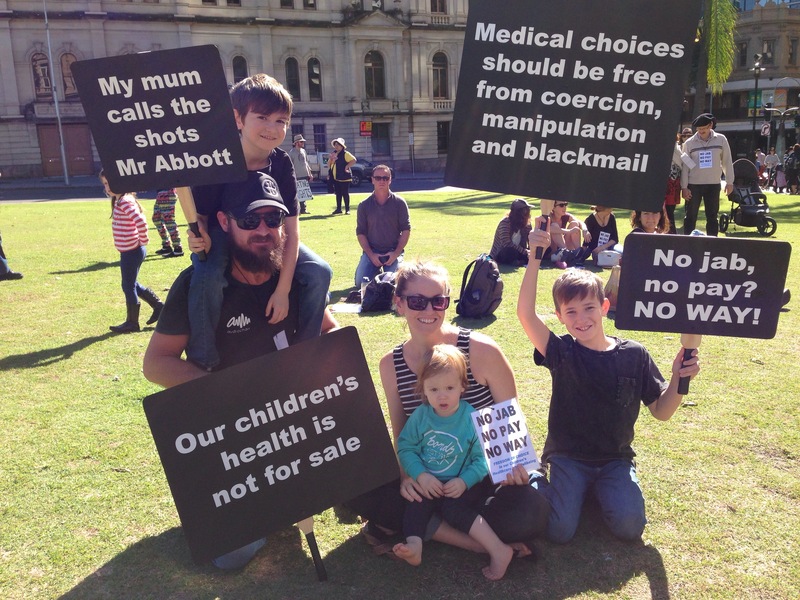 With the vaccination war reaching its pinnacle and the government continually taking away our rights, 1000’s of ordinary Aussies have had enough and they’re saying NO MORE! 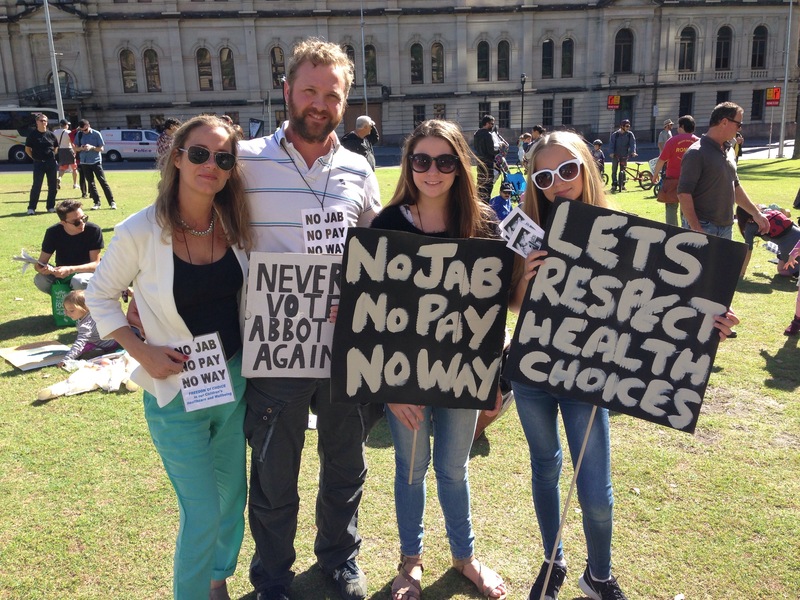 “No Jab, No Pay – No Way” was one of the key slogans chanted during the rally on Sunday June 21st, 2015. It was also the name of the campaign in which thousands of Australians took part in across the country. Many of Australia’s capital and major cities such as Brisbane, Sydney, Melbourne, Canberra, Adelaide, Perth and Launceston in Tasmania hosted activists from all over the nation with people traveling 100’s of kilometers to take part. Real News Australia along with TOTTnews were on the ground to cover the event. See below for video of the speeches as well as some images. So what’s all the fuss about? Your rights. That’s what! The Australian government along with the corporate controlled Murdoch media empire and the pharmaceutical industry are pushing extremely hard to make sure every child (and soon adult) have received all the vaccines on the current vaccine schedule. If not, they will suffer the consequences of reduced or no family tax benefits. This type of coercion is unconscionable, downright illegal, unconstitutional and even breaks Nuremberg codes established after WWII to protect citizens worldwide from medical and government tyranny. And push back they did. A huge show of solidarity on this issue was evident at the events across the nation. 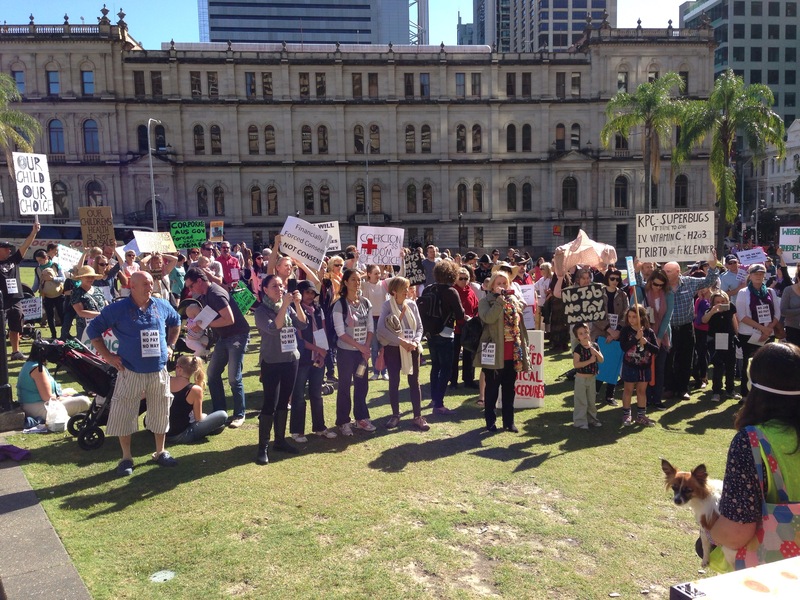 Brisbane appeared to be ground zero with a crowd around 1000 strong showing up to take a stand for our rights. “My wife and I are not anti-vax or pro-vax. We’re pro-informed choice”, said one family I spoke to. The message was clear from the get go. This event was not about pro-vax or anti-vax. It was about freedom of choice. Reserving our right to determine our own health freedom and that of our children. I had to opportunity to speak to many families at the rally in Brisbane and the underlying message was clear. Stop taking away our rights. We’re more than capable to look after our kids. Each family I spoke to had their own story to tell. Some really tugged at the heartstrings. Others were quite eye opening and some made me laugh at the contradiction that vaccines are supposed to protect you when parents themselves can prove they clearly don’t work. One young mother who was there with her son and her own Mum told me about how her pediatrician kept pressuring her to vaccinate her son. She said she originally stuck to her guns and chose not to vaccinate but eventually caved in to the constant pressure from her sons’ doctor. She then rattled off a laundry list of things her son is now highly allergic to. When prior to the vaccine he was fine. Another mother with two teenage girls, whom neither were vaccinated and looked extremely healthy, told me of her daughters school camp trip. One daughter shared a cabin with 3 other girls. The other girls were all vaccinated against pertussis (whooping cough). One girl was horribly sick during the camp. They learnt a few days afterwards that she in fact had whooping cough! She then spread the germs to the other two girls in the cabin who came down with whooping cough! The unvaccinated girl remained healthy. No whooping cough! Another family told me of how they have become ostrisized by family and friends because of the stance on vaccination. Much to the dismay of their so called family and friends, they chose not to vaccinate their baby boy. 4 years on and he’s completely healthy. Nothing more than a runny nose a few times. But due to her decision not to poison her child with heavy metals and a whole host of toxic ingredients in the vaccines, she was told by her friend she wasn’t allowed to visit the hospital to see her new baby girl because she wasn’t vaccinated. Stories like these are all too common amongst families who have made an informed decision, researched both sides of the issue and chosen not to vaccinate. And sadly some have absolute disheartening stories to tell of severe adverse reactions their children had suffered to some vaccines. The same mantra that applies to the water fluoridation issue also applies to the vaccine issue. If in doubt, get it out and where there’s risk their must be choice. There were some great speeches at the Brisbane rally with eye-opening information. Please take the time to view the videos below. What brave and courageous people. Chris Savage you are a true Peace Officer and Hero. May God richly bless you all for speaking the Truth. To everyone who went to an event for this cause i say WELL DONE. Now we need to spread the message far and wide across Australia because this does and will involve most Aussies. Thanks to ralphfucetolajd for the web form, i have just sent my letter. Section 51 (23A) prevents any form of civil conscription in order to attain any social services. It was a great turnout in Brisbane on Sunday – but of course, the mainstream media was glaringly absent. They wouldn’t dare report on such a protest, in case it alerts others to the fact that the government’s tyrannical ‘No Jab, No Pay’ policy takes away our right to informed consent to medical treatment. Or worse, it might alert people to the problems with vaccination! Another doctor whose website and YouTube channel is worth visiting is Nephrologist, Dr Suzanne Humphries. Especially look at her YouTube series, “Vaccines-Honesty vs Policy.” Part VI in this series, “The Business of Vaccination,” is a real eye-opener! Thanks Sonja. Was great to catch up with you there too!